Last Friday, I attended an event at UMass/Boston honoring Anne Kibrick. The reason was Anne's 99th birthday, and the kickoff to a $1M fundraising campaign for the Anne Kibrick Endowed Professorship in Leadership. Anne was the founding dean of the baccalaureate program in nursing at Boston State College, in 1974. I graduated from that program in 1981. Three years later Boston State was shut down, and its programs transferred to the new UMass/Boston campus at Columbia Point. Anne's educational biography includes a diploma in nursing from the Worcester Hahneman Hospital, a bachelor's in nursing from Boston University, a master's in education from Columbia Teacher's College in New York, and a doctorate in education from Harvard. She served on the nursing faculties at Simmons College and Boston University. She later was the Dean at BU's School of Nursing and Director of its Graduate Division. Anne went on to develop the graduate program in Nursing at Boston College before launching the initial baccalaureate nursing program at Boston State. I guess these make fine bullet points on a resume, but they fail to convey the substance of Anne's lifetime contributions to nursing education, and to nursing as a profession. When Anne left Boston College to come to Boston State, every nursing program in the Boston area was run by a private entity - BU, BC, Simmons, Northeastern, and Emmanuel offered at least a BSN, and were expanding into graduate programs. The remaining diploma programs at the Baptist Hospital and the Deaconess Hospital were soon to change or shut down. The diploma program at Boston City Hospital was also being closed, and with it the last available path for working class Bostonians who wanted to become nurses. Enter the two Annes - Kibrick, and her equally formidable partner, Anne Hargreaves. Kibrick's world was academia, Hargreaves' the rough and tumble of Boston politics as the Executive Director of Nursing in the Department of Health and Hospitals. I'm leaving out many tedious and gory details. It was a battle royal, with opposition ranging from the Governor's Office (really, Mike?!?) to, more predictably, every other BSN program in the city. But together they prevailed and established the first BSN program at a public college or university in Boston. This is what their work looks like today. Anne spoke about all of this last Friday. She was as clear and determined as I remembered her those many years ago. I was enrolled in the RN to BSN evening program at Boston State, having earned my diploma in nursing a few years earlier. On those evenings we had class, I escorted Anne to her car, and she gave me a ride to Coolidge Corner on her way home in Chestnut Hill. I don't remember the substance of what we discussed on those rides, but I know that Anne was always supportive and encouraging of my slightly off-center ideas about how nursing can help address some of our most intractable and frightening challenges, like the health dangers of nuclear weapons. I also interviewed her for the Boston State College student paper, Feedback. That's what you see above. I haven't been able to find the original tabloid, and will instead have to reconstruct our interview line by line from the smaller copy that I scanned for this image. 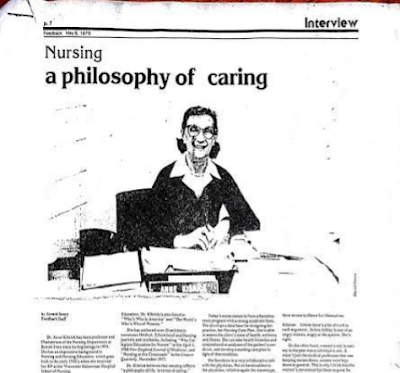 "Nursing really reflects a philosophy of life, in terms of caring. In nursing there are so many areas that you can move into, depending on what your own needs are. You can express your philosophy through your choice of occupation. You can do bedside nursing, or you can work in the community. You can carry your own caseload as a nurse practitioner. You can go into teaching, or administration. There's no one type of person who becomes a nurse, because there are so many ways to practice nursing." Teachers change lives, and I'm happy to say that Anne Kibrick changed mine.